In 2015, the Future of Privacy Forum (FPF) set out to gain a better understanding of what public school parents actually know and want concerning the use of technology and collection of data in their children’s schools, as well as their perspectives on the benefits and risks of student data use within the educational system. Media reports routinely quote parents who are afraid or reluctant to support the use of technology, electronic education records, and student data within their own schools or throughout the educational process. The original survey sought to understand the views of parents, the critical stakeholders in the education policy discussion. Results showed that parents were generally aware of and understood the technology used in their children’s schools, but lacked knowledge of many of the specific laws and practices that provide guidelines and important protections for children’s information. Since we reached those conclusions, the public conversation on this topic has barely slowed. Therefore, this year we returned to parents to find out – has their understanding grown? Have their concerns changed? And we had new questions to ask, as technology is used in ever-expanding ways, and the effects of those newly passed laws begin to be felt. Today, we are releasing our 2016 survey, Beyond One Classroom: Parental Support for Technology and Data Use in Schools. Largely, our findings parallel those from last year. Unsurprisingly, it remains true that the closer the use of the data is to the individual classroom and to their own child, the more strongly parents support, and desire, the benefits of student data collection and use. As data use becomes less directly tied to students, parents still want to comprehend the benefit to the classroom. Parents support research that can be used in a school or classroom to directly benefit students. What changed from last year to now? Technology use is spreading, fast. Almost eighty percent of parents are now using school-related technology to keep up with their child’s educational progress, and ninety percent of children are using technology provided or recommended by their school. 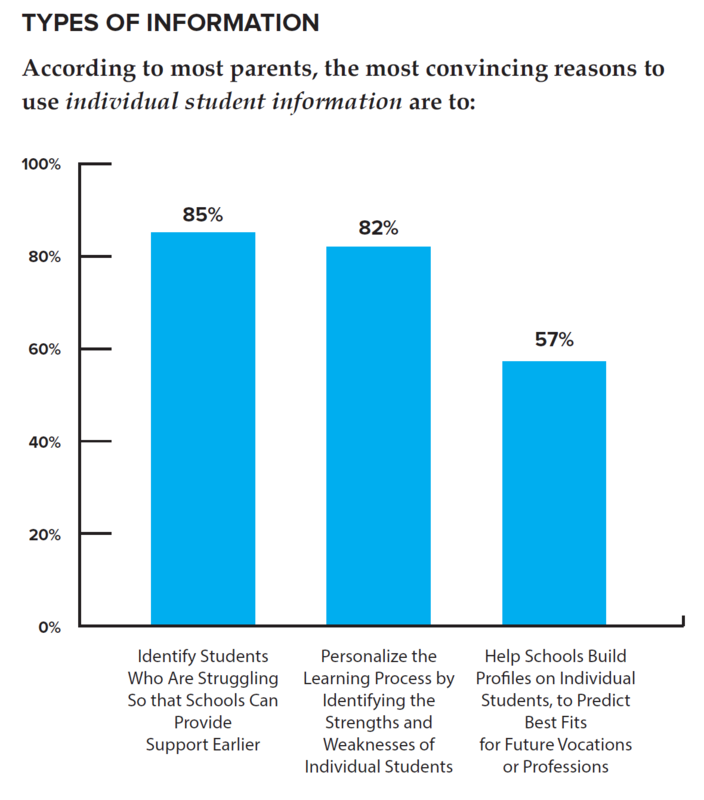 In addition, parents increasingly see the value school districts gain from the use of a variety of personal data – with growing percentages saying that in addition to categories like grades and attendance, it is appropriate for schools to use data concerning disciplinary records and participation in school lunch programs. Even more noteworthy, parents may be seeing the value of broader research based on analysis that necessarily includes traditionally “sensitive” information. Support for the collection and use of parents’ marital status, family income, and social security numbers all increased significantly; perhaps most importantly, over half of parents of school age children now agree that race and ethnicity are data that is appropriate for collection and use by schools. The use of this type of data, appropriately controlled and protected, is critical for research that identifies potentially discriminatory policies and practices, and it is heartening to see that parents appreciate the value this data can provide when it is used responsibly. One new finding was that nearly all parents of school age children believe they should be informed with whom and for what purpose their child’s record is being shared. In addition to schools telling parents when the record is shared for educational purposes, we also asked about an increasing trend from state laws that may be limiting the rights of parents: while schools have the ability to share the educational record with partner vendors for core educational functions, parents may want to protect their ability to authorize use of their child’s electronic record to external third parties – for example, for tutoring programs, non-school-sponsored educational clubs or activities, or financial aid and advance educational programs. An important area that remains a prime target for better communication and awareness is helping parents understand current laws and practices that protect student data. Slightly fewer parents than last year felt confident that they know what federal laws currently protect student data, or what those laws require. This is such a clear issue that advocates and educators at all levels should focus part of their future outreach on making parents aware of these existing requirements. The FPF Parent Guide To Student Privacy, written in cooperation with the National PTA and ConnectSafely, can be a great start in providing parents with that information. The Foundation for Excellence in Education recently released a “Student Data Privacy Communications Toolkit” that provides districts and states with templates for webpage content, letters to send home to parents, and many other key ways to communicate. 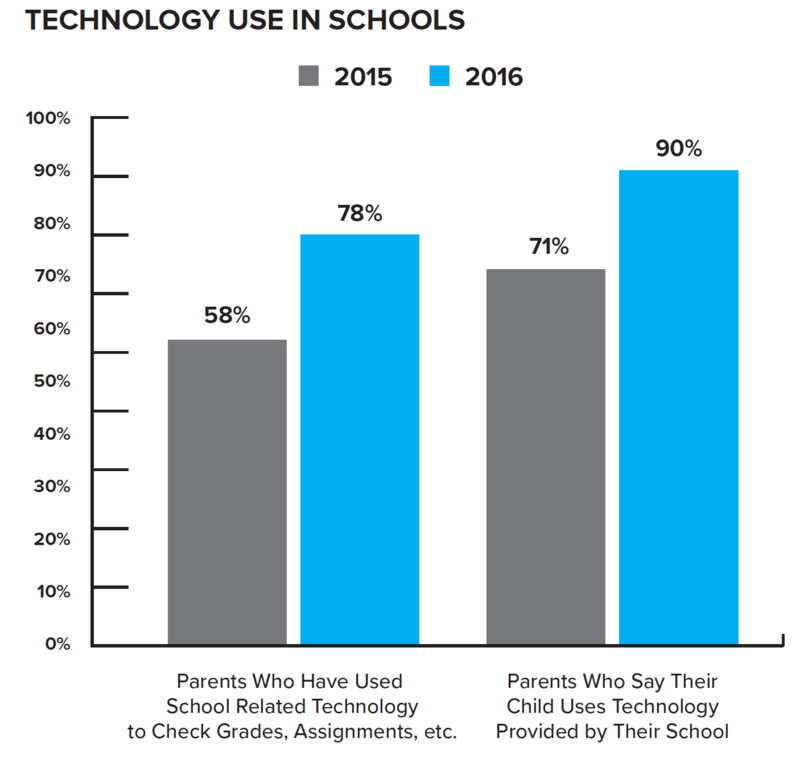 Overall, our 2016 survey showed the increasing prevalence of technology use by both parents and students, increasing levels of support by parents of the appropriate collection and use of data by schools, and continued strong belief in the possibilities of technology to improve their child’s educational opportunities. The goals for educators, advocates, and policymakers remain to communicate policies clearly; establish transparent practices; and work with parents as key partners in the educational system to achieve the best learning outcomes for our children. Beyond One Classroom was produced with funding provided from the Bill & Melinda Gates Foundation. Brenda Leong is senior counsel and director of operations at the Future of Privacy Forum. Amelia Vance is policy counsel for education privacy at the Future of Privacy Forum.